Simple and easy, the perfect lunch or party appetizer! 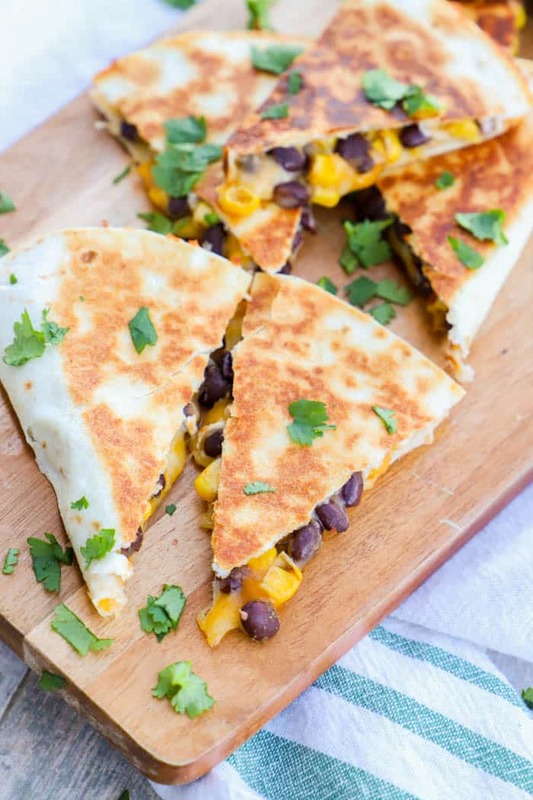 These Black Bean and Cheese Quesadillas are so simple and full of flavor. I seasoned my beans and corn then added them to the tortilla with cheese. My husband is a big fan of black beans. When we need something different for lunch I usually make these simple Black Bean and Cheese Quesadillas. They only take a few minutes to finish and have the best flavor. When I made them last week I thought about how perfect they would be for as party food. Maybe for the next Sunday game, I can serve them up with! Even my kids love these I love to serve mine with sour cream and cilantro. No matter how you serve them I think you are going to love this simple recipe. This recipe is so simple to make. I only used 6 simple ingredients that you might already have in your kitchen right now! Step one: First you want to drain and rinse your corn and black beans. Place your beans and corn in a small bowl and season with cumin then mix. Step two: Heat skillet over medium heat and 1/2 teaspoon of butter. I used about 1/2 a teaspoon for each quesadilla to grease the skillet. If you are making more than one at a time you can add more butter at each time. Step three: Once your skillet is heated and butter has melted place a tortilla in the skillet. To that tortilla add 1/2 cup of shredded cheese along with a spoonful or two of your seasoned beans and corn. Fold in half and allow to cook for a few minutes before flipping. Step four: Cook until cheese is melted then remove from the skillet. Repeat with the remaining tortillas. I love serving these quesadillas topped with fresh diced cilantro and sour cream. Share in the comments your favorite thing to serve with them. For this recipe, I used both canned black beans and corn. If you want to use something else check out these tips. Frozen corn: If you want to use frozen corn you will want to fully thaw it before using. Once thawed you can follow the remaining instructions. Fresh corn: If you would like to use fresh corn you will need to cook until softened first. Once soft drain well and continue with the remaining instructions. Dry beans: When using dry beans you would want these prepared before adding them to your quesadillas. Cook them according to the package instructions then continue with the remaining instructions. 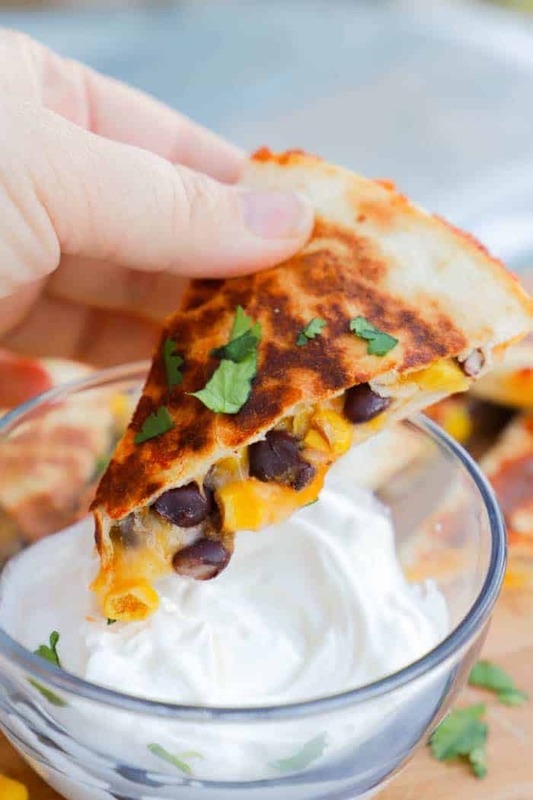 Pizza Quesadilla: I’m sure you could have guessed that this recipe is a favorite with the kids. I love serving it with a side of warmed pizza sauce for dipping. BBQ Chicken Quesadilla: I love this recipe. These quesadillas are loaded with chicken, bbq sauce, red onions, and cilantro. A favorite around here and so simple to make. Bacon Cheeseburger Quesadilla: Yep you read that right! Bacon, ground beef, lots of cheese, and a pickle on the side of course. Start by draining and rinsing corn and black beans then place in a small mixing bowl. Season with cumin and mix. Heat skillet over medium heat and 1/2 teaspoon of butter. Place a tortilla in the skillet and add 1/2 cup of shredded cheese along with a spoonful or two of your seasoned beans and corn. Fold in half and allow to cook for a few minutes before flipping. Cook until cheese is melted then remove from the skillet. Repeat with the remaining tortillas. 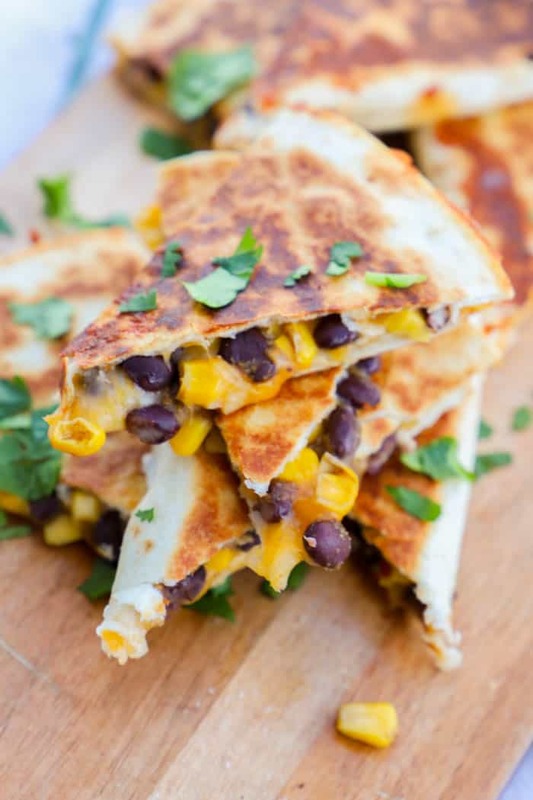 Yum yum yum – love a good quesadilla, so quick & easy! These bean quesadillas look really good! I’m not into beans or black beans for that matter but they look delish!! Thanks for sharing! This looks SO good. Definitely going to have to try it soon! These look amazing! 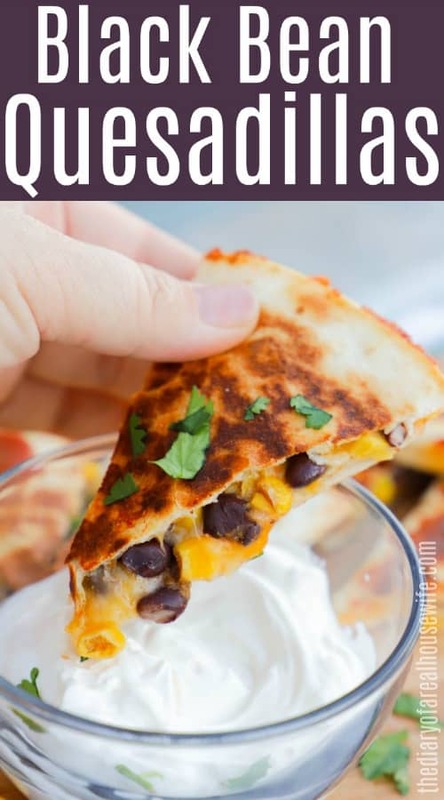 My family loves quesadillas, so I am bookmarking this recipe! Thanks for your nice comment on my blog post. Hopping over from the Collective! I was just mentioning last night how much I love bean and cheese burritos, so I definitely need to make this! Jenny, I am bad about not planning lunches, too, so this is a great post for me. Besides, QUESADILLAS! 😀 Thank you for sharing this with us at Treasure Box Tuesday- pinned!